Pearson's Crystal Data is a crystallographic database published by ASM International (Materials Park, Ohio, USA), edited by Pierre Villars and Karin Cenzual. It has its roots in the well-known PAULING FILE project and contains crystal structures of a large variety of inorganic materials and compounds. The "PCD" (as it is typically abbreviated) is a collaboration between ASM International and Material Phases Data System, Vitznau, Switzerland (MPDS), aiming to create and maintain the world's largest critically evaluated "Non-organic database". 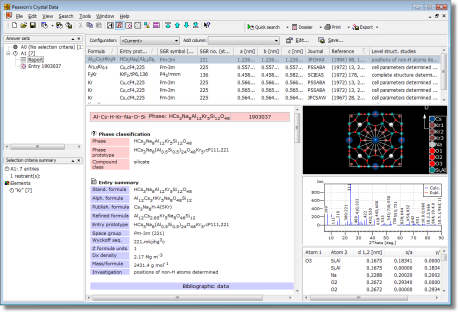 The current release 2018/19 contains about 319,000 structural data sets (including atom coordinates and displacement parameters, when determined) for about 180,200 different chemical formulas, roughly 19,400 experimental powder diffraction patterns and about 297,000 calculated patterns (interplanar spacings, intensities, Miller indices). In addition over 46,000 figure descriptions for such as cell parameters as a function of temperature, pressure or concentration are given. To reach this result, scientific editors have critically analyzed and processed over 103,200 original publications. The database comes with an innovative retrieval software for Windows PCs developed by Crystal Impact. It offers a large variety of new elaborate new features which make retrieval of the desired information extremely easy and comfortable.